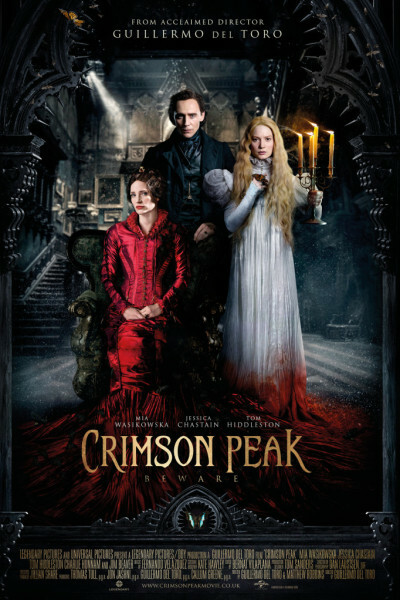 "Crimson Peak" is a stunningly gorgeous film. Sumptuous, aromatic, and delicious layers of set design, cinematography, and thick velveteened costumery abound throughout. It's no "Pan's Labyrinth," but is every bit as pleasurable as 2010's "Don't Be Afraid of the Dark" starring Katie Holmes and Guy Pearce. Guillermo del Toro is an artiste, and every scene crackles and pops and oozes. Tom Hiddleston is perfect, and Jessica Chastain is so delightfully hate-able. Mia Wasikowska is annoyingly clueless, but very well: that's as it should be given her character. The FX felt reminiscent of del Toro's earlier collaboration with Chastain (2013's "Mama"), but I saw that film on opening night in a theater packed to the gills with 300 screaming teenage girls, which made it all the more bumpy and jumpy and fun and frightening, so I loved it, too. There's nothing quite like a full house that is simultaneously entranced and hypnotized by a horror film. So cool, like seeing "Insidious" or "Babadook" on opening night at midnight. Anyhoo, Crimson Peak includes a perverse and twisty ending, but remains HIGH ART. Really beautiful and spellbinding. If you see it, you'll be fully seduced by its visual aesthetic. But when it rounds the bend near the end, don't claim I didn't warn you.